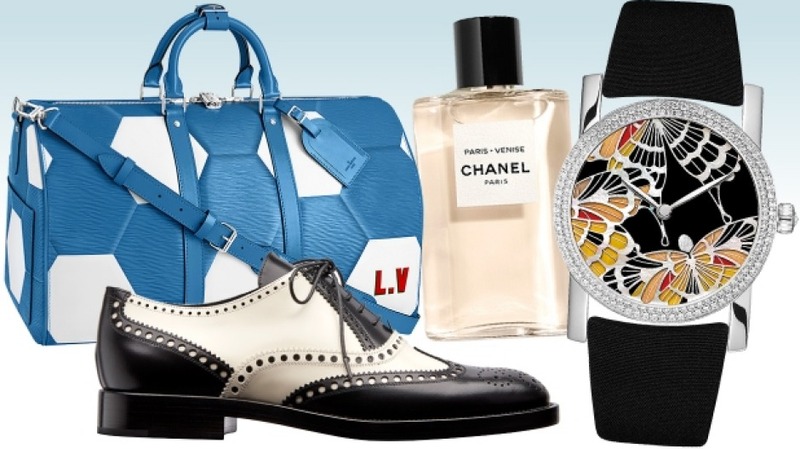 FIFA World Cup Keepall by Louis Vuitton, Oxfords from Christian Dior, Chanel perfume and Chaumet watch. From truffles to sharp tailoring, indulgence can be found in many forms in this week’s Spend edit. Van Cleef & Arpels’ Vintage Alhambra collection celebrates its 50th anniversary this year, and the luck-inducing four-leaf clover talisman is ageing awfully well. In honour of its birthday, the French maison has released some elegant new creations, including these pale grey mother-of-pearl Magic Alhambra earrings set in pink gold with a sprinkling of diamonds. $21,800. There’s an art to keeping an all-black outfit interesting. It is, of course, all in the detail. Take this look from Emporio Armani. The devil is in the double-breasted jacket, the touch of logomania and the delightfully bedazzling loafers. Voila. Jacket, $1700; tracksuit, $1500; beret, $390; loafers, $780. An attitude of reckless nonchalance is practically a given when wearing these rather dandy perforated monochrome Oxfords from Christian Dior. $1590.